Packing a 21.5-inch, 1920 x 1080 LED touch screen and running Android 4.3 Jelly Bean, the Slate 21 Pro offers Kingsoft Office out of the box and 50GB of free Box storage to get end users started. And through an HDMI-in port and included USB upstream cable, this AiO can serve as a second monitor for a Windows PC. Behind this, plus a 720p webcam for video conferencing, is a 1.6GHz, quad-core Nvidia Tegra 4 T40S CPU that runs at up to 1.8GHz on a single core mode. However, just 2GB of DDR3 RAM and 16GB (expandable via SD card reader) of flash storage are behind that chip. Rounding out its I/O selection, the Slate 21 Pro sports 1 USB 2.0 port on its side and two more around back, RJ-45 Ethernet and a headphone/mic jack. On the wireless front, 802.11 a/b/g/n Wi-FI and Bluetooth 4.0 come standard. While HP has made every measure to make the Slate 21 Pro business-ready, including Citrix support through a suite of apps, we're not quite sure we get the point. What does Android offer in a desktop form factor that Windows can't? We'll try to find out on the CES 2014 show floor. 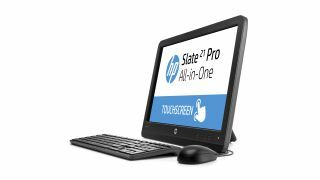 The HP Slate 21 Pro is available now in the US for $399 (about £242, AU$444). HP is so bullish on all-in-ones in the office that it has three Windows-based solutions at the ready. First up is the company's ProOne 400 G1, a Windows 8.1 AiO that comes in 21.5-inch (touch-enabled) and 19.5-inch (non-touch) variants. The 21.5-inch variety comes packing a 1080p display, up to an Intel Core i7 processor and as much as 2TB of hard drive space. The 205 G1 is HP's play at an affordable, Windows-based all-in-one PC for enterprise use. The result is an AiO with an 18.5-inch, 1366 x 768 WLED screen housing a 1.48GHz, dual-core AMD E1-2500 chip – running Windows 8.1 (Pro optional) or Ubuntu – with up to a 2TB, 7,200 rpm hard drive. Finally, we have the second generation of what HP calls "the world's first and only AiO workstation with a 27-inch display," the HP Z1 G2. This time around, HP offers the business unit with Windows 8 Touch and Intel Thunderbolt 2 ports. All three of HP's new Windows-based, business-grade all-in-one PCs are available now in the US, with the ProOne 400 G1 going for $649 (around £395, AU$723) for the non-touch version and $799 (about £486, AU$890) if you want a touchscreen. While HP has not shared pricing for the Z1 G2, the 205 G1 goes for $449 (around £273, AU$500).